While playing Apex Legends on PC is the way to go for most people, there are a couple of players that would rather do so on a gaming laptop due to the portability. You can take a laptop wherever you go and other kinds of work can be done as well. Nowadays laptops are fast enough to run modern games and you should take advantage of that. If you are in the market for a new laptop and are interested in gaming, then you have come to the right place. Here we are going to look into the best laptop for Apex Legends available right now. When you’re getting a gaming laptop, consider what you actually need it for and how you’re going to use it. Start with what type of games you’re going to play (look at the recommended requirements) and work from there. With the laptops mentioned here below, you’ll beat these easily for a smooth and high FPS gaming experience. 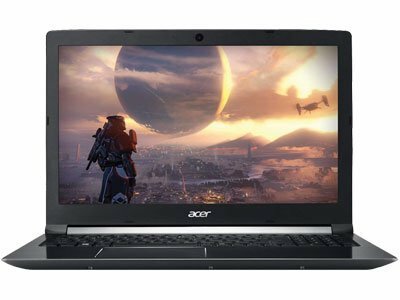 Buying a laptop for gaming can be quite complicated because there are so many hardware and specifications to choose from. Not only that, the machine has to have enough performance for today’s modern games. 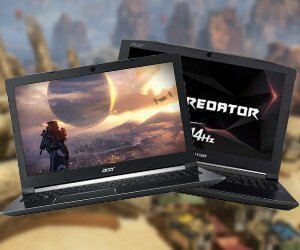 Our article is all about finding some of the most optimal laptops for playing games like Apex Legends. We have compiled a list of some excellent choices for you. The following are all the gaming laptops that we are going to talk about here and some of their specifications that you might be interested in learning about at a glance. You’ll find a more in-depth review of every gaming rig further down this article. This comparison table consists of our absolute top rated picks after having a look at most rebuilt gaming PCs available. Predator is the gaming brand from Acer and here we have the Helios 300 which is a mid-range laptop that offers ample power if you are interested in playing Apex Legends. The laptop comes with an Nvidia GTX 1060 which is the most popular card in the Pascal series and is ideal for playing pretty much any game at 1080p. With the GTX 1060, you will be able to play Apex Legends with pretty much all settings turned up to max at 60 FPS. 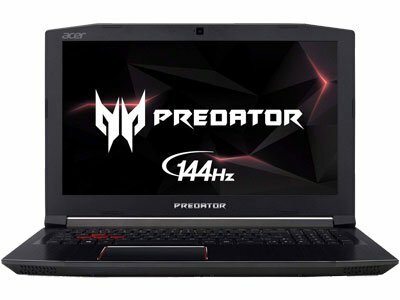 The Acer Predator Helios 300 gaming laptop is an impressive machine that can deliver performance close to that of a similar spec gaming PC. It is lighter than it looks and the keyboard feels great. The laptop has a premium feel which is something that you expect to get when you are paying this much for a gaming laptop. If you are interested in playing Apex Legends at 1080p then this is an option that is worth looking into. The laptop screen has a 144 Hz refresh rate so you can game at 144 FPS if that is what you are interested in. Higher refresh rates translate into smoother gaming experience which is something that you need to see for yourself in order to experience the difference. You also have the Intel i7-8750H CPU which has 6 cores and 12 threads. The extra cores will come in handy if you are multitasking or are interested in content creation as well. This is a fairly powerful device and can be used for multiple applications other than gaming. For storage, you have a 256 GB SSD and there is an extra slot in which you can install an additional SSD or HDD. You also get 16 GB of DDR4 RAM that runs at 2666 MHz. The PredatorSense gaming control panel can be used to customize and tweak different features and settings. All things considered, this is a great product for the price and offer decent performance. Here is what you need to know about the Acer Predator Helios 300 gaming laptop. MSI is known for introducing some really great gaming products and here we have the GV62 laptop. The device has a Black and Red look which will sit well with most gamers. Other than that, this is a relatively entry-level gaming machine and while you do get a decent CPU, it is paired with the Nvidia GTX 1050 Ti graphics card. This is not a bad card and will run Apex Legends just fine at 1080p 60 FPS but you might need to turn down a few settings. 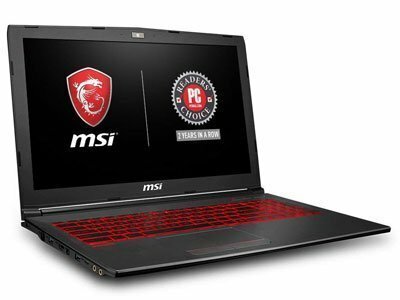 The MSI GV62 is a great gaming laptop for the price. While it might not be the most powerful gaming laptop, it can handle games such as Apex Legends. If that is what you are interested in playing then this is a budget laptop that you should look into. The laptop is priced accordingly and costs lower than some other models that we have on this list. You also have the Intel i7-8750H CPU which has 6 cores and 12 threads. The extra cores will come in handy if you are multitasking or are interested in content creation as well. Other than that, you get 8 GB of RAM which is recommended for gaming and for storage you have a 128 GB SSD for your boot drive and a 1 TB HDD for mass storage. The keyboard is backlit so gaming in the dark will not be an issue. There is a model that comes with the RTX 2060 but you will need to pay a lot more for that. All things considered, this is an impressive machine and can deliver a decent amount of power which is ample if you are interested in playing Apex Legends. Here is what you need to know about the MSI GV62. The Acer Aspire 7 has similar specs compared to the MSI laptop that we have talked about. It comes with the 6-Core i7-8750H CPU, GTX 1050Ti 4GB graphics card and 8GB DDR4 memory. For storage, you have a 128 GB SSD and a 1 TB HDD for mass storage. The laptop also comes with a fingerprint scanner for easy access and you have a copy of Windows 10 installed with the device. The Acer Aspire 7 is an impressive little machine that offers great value for money. This is a very subtle laptop and that is why it can blend into an office environment very easily but you can get to gaming in your free time as well. If you are looking for a subtle gaming machine then you have it right here. The device comes in Black and is very subtle. It does not look like a gaming machine at all but do not let that fool you. The GTX 1050 Ti will run Apex Legends just fine at 1080p 60 FPS but you might need to turn down a few settings. All things considered, this is an impressive device for the price and if you are looking for something that is subtle but allows you to play some games then this is something that you can look into. Here is what you need to know about the Acer Aspire 7. Dell is very well-known in the gaming space and while the company has a dedicated gaming brand by the name of Alienware, here we have a gaming laptop from Dell that has decent specifications and is priced like a mid-range laptop. The CPU is an older one and you get the Intel Core i5-7300HQ that has 4 cores but it is still more than capable of running Apex Legends at 1080p 60 FPS and even higher. If you are interested in playing Apex Legends. The laptop comes with an Nvidia GTX 1060 which is the most popular card in the Pascal series and is ideal for playing pretty much any game at 1080p. With the GTX 1060, you will be able to play Apex Legends with pretty much all settings turned up to max at 60 FPS. This Dell gaming laptop has a subtle design and does not look like other gaming laptops. This means that you can take it to work with you and not have anyone notice that it is a gaming machine. Other than that, it is great value for money and the performance is decent as well. If you are looking for a subtle gaming machine that you can take to work then this is an option that you can look into. For storage, you have a 128 GB SSD coupled with a 1 TB HDD for mass storage. This should be enough for fast boot times and loading speeds as well as most of your games. The laptop has an IPS display which means better color accuracy even though the response time might be a bit higher. While the laptop comes with 8 GB of RAM as standard, it is upgradeable and can be upgraded to 32 GB. This is something that can come in handy down the line. All in all, this is an impressive product is you can live with the relatively older design. Here is what you need to know about the Dell gaming laptop. Razer is known for making some impressive premium gaming products and here we have the Razer Blade that Is a thin and light gaming laptop that the company makes. This model comes with the Intel i7 7700HQ CPU with 4 cores which is great for gaming. The CPU has a base clock speed of 2.8 GHz and can boost to 3.8 GHz. On the graphics side, it has the GTX 1060 graphics card. The Razer Blade is a premium device and costs a lot of money but a lot of hardware has been crammed into this small form factor. The metal body feels great but you can see fingerprints on it after use. If you want the best of the best then this is something that you should look into. The laptop comes with a 1080p display and the graphics card is more than capable of running Apex Legends at this resolution at 60 FPS. The thin and light compact laptop comes with 16 GB of RAM and 512 GB of fast SSD storage. This device is VR read and comes with all kinds of features such as Razer Chroma RGB lighting. This is a lot of power for such a compact, thin and light device but all this performance does come at a cost and the Razer Blade is a very premium device. You can get similar hardware from other brands at a much cheaper price but not in the same form factor and that is what Razer is charging you extra for. Here is what you need to know about the Razer Blade. Asus has made a name for itself in the gaming space and that is because of the premium and quality products that it has to offer. Here we have the ROG Strix Hero II gaming laptop which is a beast when it comes to gaming. The laptop comes with a 1080p 144Hz display and the hardware that can run games like Apex Legends at the high refresh rate. The ASUS ROG Strix Hero II is a great gaming laptop that has an impressive design and build quality. If you are looking for a laptop that not only performs well but looks good too then this is an option that you should consider. The CPU is the Intel i7 8750H which is something that is pretty coming in gaming laptops these games and is a part of most of the gaming laptops that we have covered on this list. You also get 16 GB of DDR4 RAM and for storage, you have a 256 GB PCIe SSD for fast boot times and quicker loading in games and for mass storage you have the 1 TB HDD. The laptop is VR ready and comes with a copy of Windows 10. The keyboard has RGB lighting and you also have an RGB strip on the front of the laptop. The design keeps gamers in mind and while there is a bit of a chin, the bezels are very thin indeed. If you are a gamer and can spend a bit more on a branded gaming laptop then this is a great option to keep in mind. Here is what you need to know about the ASUS ROG Strix Hero II. Omen is the gaming brand from HP and here we have an Omen gaming laptop. From the first look, you can see the unique design that sets it apart from all the other products that we have looked into. While there is a bit of a chin on the bottom, the bezels are fairly thin. The power is decent as well. The Omen laptop is an impressive device with a unique design. The hardware is decent and the price is lower than some of the other options that we have looked into. If you are interested in playing Apex Legends then this is an option that you can look into. The GTX 1050 Ti will run Apex Legends just fine at 1080p 60 FPS but you might need to turn down a few settings. The CPU can keep up with the graphics card as well. It comes with the Intel i5-8300H processor which is not the best processor in the series but will get the job done. All this also means that the Omen laptop is not as expensive as other options that we have looked into. The laptop has a Black and Red theme which looks great. It also comes with 12 GB of RAM which is great for gaming and will ensure that Chrome does not slow down your laptop. Other than that, you also have a 128 GB SSD for quick booting and a 1 TB HDD for mass storage. The battery life is not that great when gaming but then again the same can be said about all gaming laptops. Here is what you need to know about the Omen laptop. Here we have looked into some of the best gaming laptops that are available on the market. Some models are expensive as compared to others and that is because manufacturers charge a premium for design and form factor. The Razer Blade is the most expensive option that we can recommend and while there are even more expensive laptops on the market, they are not something that we can recommend to the masses and only meet the needs of a small segment of the whole market. Remember that you do get what you paid for and if you are interested in making a long-term investment and are going to use this device for 3-5 years then you might as well spend a bit more and get a device that is built well and the performance will be up to the mark for the years to come. A laptop is a major investment, especially a gaming one so saving some money might not be the way to go. We have included some relatively cheaper alternatives for people that are on a budget and are not interested in spending too much money on a gaming laptop. You should also make sure that the laptop you are getting can be upgraded down the line. If not then you should get the higher spec model and keep in mind how long you intend on using it so that the hardware does not age badly. I hope that we have included something for you and that you now have a better understanding of the different laptops that are available on the market. I hope that you find a model that is the right fit for your needs.